Completely redesigned for 2009, the Nissan Murano has taken the lessons learned from its first-generation crossover and improved the entire vehicle, so unsurprisingly nothing has really changed for 2010 except the price. The interior quality has been substantially improved to the point where an upgraded Murano feels more like its pricier big brother Infiniti FX series than a Nissan. The Murano is large SUV, even by today’s somewhat generous standards, but thanks to a powerful V-6, lithe steering and a car-based chassis, it does a fine job of masking its mass. 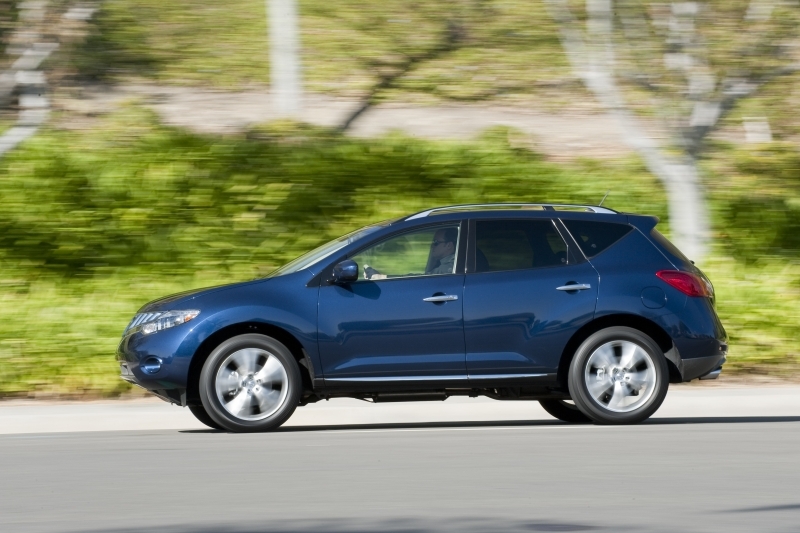 While all-wheel drive is an option, one thing is for sure: the Murano is no mountain climber. That said, what it lacks in athleticism it more than makes up for in comfort and everyday drivability. Best of all, with plenty of options, there is a Murano for everyone, from the stripped-down front-wheel drive base model to luxurious all-wheel drive high-end LE. 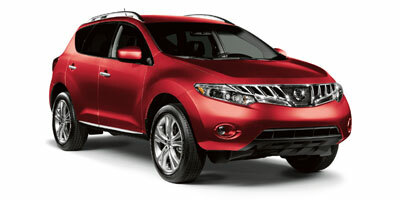 The Murano incorporates SUV-like size and legroom without being an overly cumbersome vehicle. Standard features are robust – though the one option we’d recommend is the premium package, which comes at a reasonable price. The curves of the Murano are particularly attractive and give the SUV a distinctive look in a crowded and somewhat bland class. Cargo space, while good, has been sacrificed for style due to the sloping rear hatch – it’s not too big of an issue, but certainly noticeable when you’re using the trunk. CVT transmissions aren’t for everyone – for this price, a standard automatic option would be nice, as would a somewhat more fuel-efficient engine. The Murano’s curvaceous lines can make its size look somewhat deceptive, but once inside, you’ll realize just how big of a car it is. Drivers enjoy high seat placement and intuitive, ergonomic controls. Despite the SUV’s bulk, the powerful V-6 engine moves it along with ease. 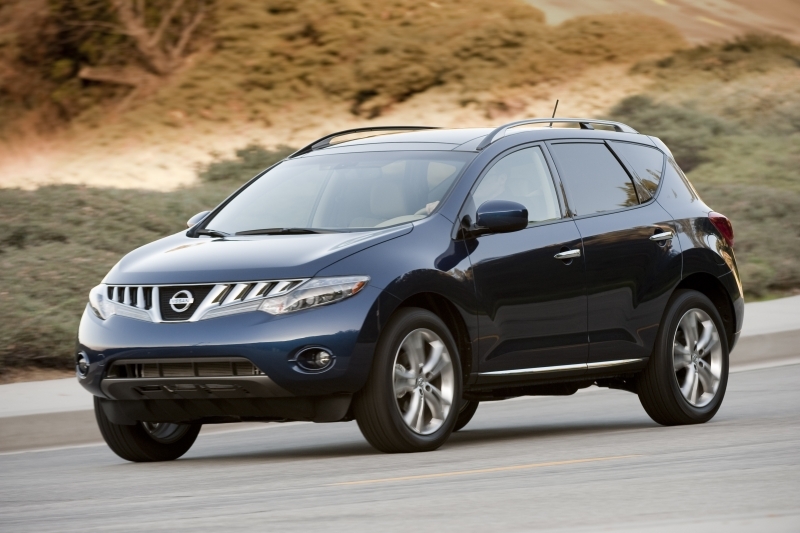 Steering is light and relatively devoid of feedback, it seemingly fits the Murano’s character perfectly. Thanks to the midrange torque provided by the V-6, the CVT transmission doesn’t lag too far behind driver inputs as it tends to with Nissan’s four-cylinder engines. As long as you aren’t looking for 6,000-rpm shifts, you likely won’t have any issues. 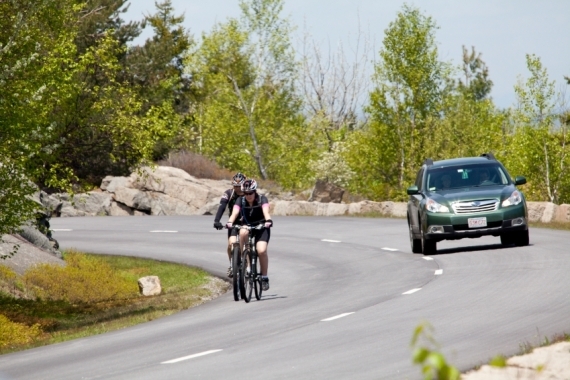 Overall the ride is comfortable and compliant over broken surfaces thanks to the cushy suspension, making it a perfect daily driver. Looking for a little extra light? Nissan offers an optional dual-panel moonroof that illuminates both the front and backseats when open. The Murano also comes equipped with front and rear mood lighting to add to the car’s cozy atmosphere at night. 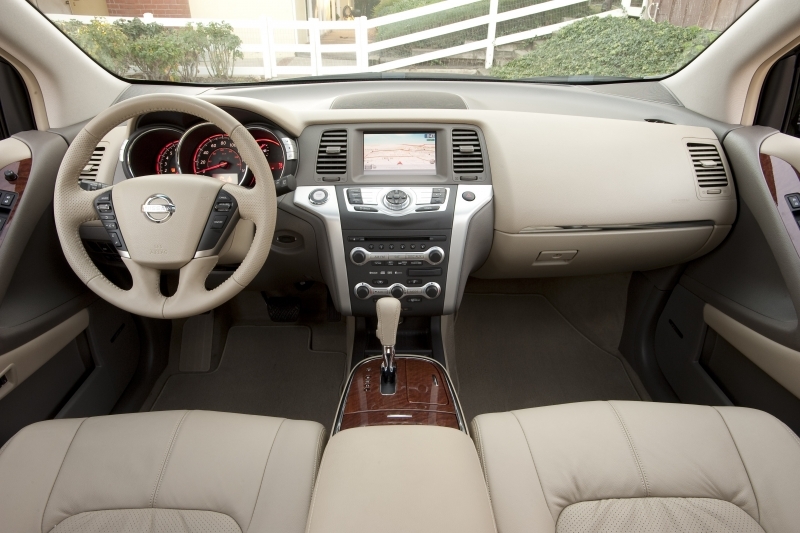 Leather will cost you $1,600, but it is of high quality and we feel it really ups the interior ambiance of the Murano. Another interesting option is Nissan’s Intuitive All-Wheel Drive system that adjusts to the driving conditions by using all four wheels for starts and cornering, but only driving the front wheels during cruising, ensuring greater fuel economy and a more comfortable ride. For just $1,000, you can’t go wrong with the cost-effective Premium Package, which adds amenities such as Bose audio, XM satellite radio and a rearview camera, all of which are managed by a seven-inch color display mounted atop the center console. Navigation isn’t included however, and comes at a $1,850 premium. Nissan also offers a $1,600 DVD system, which features a fold-down nine-inch screen with remote and wireless headphones. 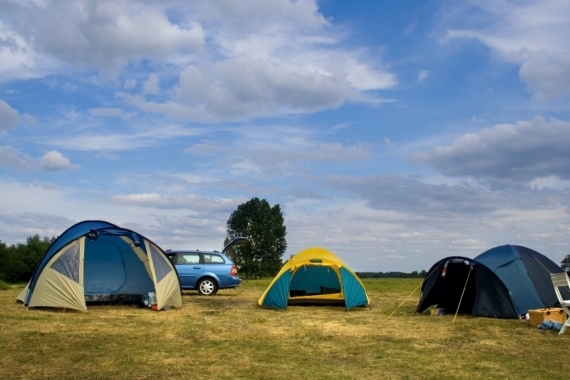 We’d recommend both the DVD and nav systems if you plan on taking lengthy road trips. Unlike its smaller sibling, the Rogue, the Murano’s CVT transmission doesn’t net too much of a fuel economy advantage over the competition. The 3.5-liter ULEV V-6 remains thirsty despite the frugal drivetrain, and while the figures are in line with the six-cylinder competition at 18 mpg city, 23 mpg highway, others like the Hyundai Santa Fe are more fuel efficient. The interior of the Murano is spacious but not overly so, with plenty of extra legroom in the back seats. The car uses a start/stop button for the ignition, which is a nice technological touch, but unlike most models, it requires the key fob to be placed in the dash before it will start. The color display on top of the center stack adds a nice touch and keeps the driver’s attention near the road. 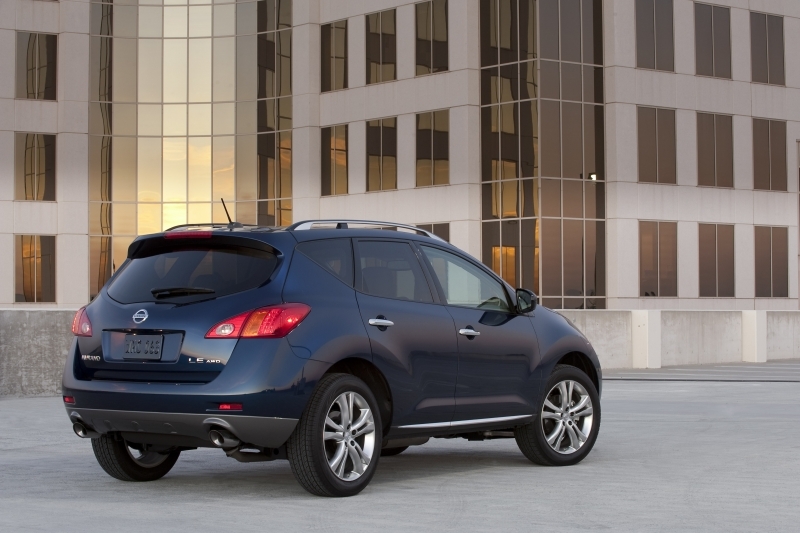 The Murano received a facelift for 2009, but most will recognize it as just a few subtle nips and tucks – which is a good thing, as the old design was both attractive and edgy. The hood and windshield blend together a bit more, there’s a new front grille and the headlights have lost their yellow corner markers. The front and rear fenders have a slight flare to them, adding a hint of Z to the package. Prices start reasonably with the Murano S carrying an MSRP of $28,340 and the Murano SL coming in at $30,460, but the LE model jumps up to a staggering $37,110. We’d consider key competitors in the mid-size crossover segment to include the $30,295 Hyundai Santa Fe Limited AWD, $27,650 Mazda CX-7 s Touring AWD and Mercedes-Benz GLK 350, which starts at $34,600.